The Hemispheric South/s Research Initiative and the Center for Literature and the Environment will host an innovative event that invites participants to make meaning across fluid boundaries of theory, praxis, social justice movements, disciplinary knowledge, and affective response. ::Bodies in Space: Flow/s:: begins with a series of roundtables and ends with a guerrilla-style performance. Highlights of the program include a master class by theatre artist Sharon Bridgforth and a keynote address by cultural critic Dr. Jennifer Brody. “Flow/s” offers us a way of thinking through the shifting intellectual landscape of our fields, as well as the changing dynamics of our bodies within the global environment. By creating a performance around the notion of “Flow/s,” participants will use dance, poetry, group improvisations, solo performance art, and critical theory to engage and creatively inhabit issues of ecological justice as they relate to questions of embodiment, place-based models of selfhood, performed and performative identities, race, gender, sexuality, aesthetics, and ethics. 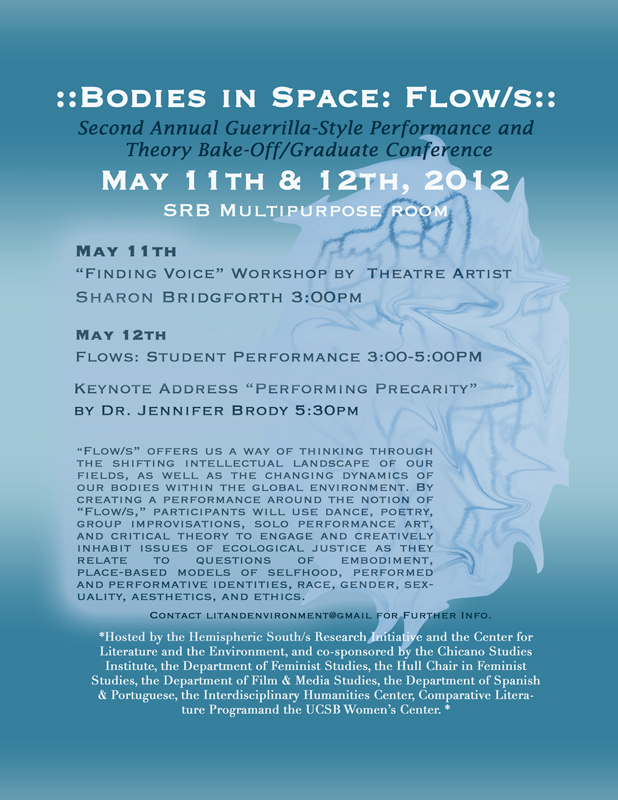 Dr. Brody will give a keynote address as part of the 2-day graduate performance conference, ::Bodies in Space: Flow/s:: Brody is a professor of Drama at Stanford University. Her work has appeared in Theatre Journal, Signs, Genders, Callaloo, Text and Performance Quarterly and in several edited volumes. Her books, Impossible Purities (Duke University Press, 1998) and Punctuation: Art, Politics and Play (Duke University Press, 2008) both discuss relations among and between sexuality, gender, racialization, visual studies and performance. She has served as the President of the Women and Theatre Program, on the board of Women and Performance and has worked with the Ford and Mellon Foundations. She co-produced “The Theme is Blackness” festival of black plays in Durham, NC, and curated “Ultra Super” at the Franklin Humanities Center at Duke University. Her research and teaching focus on performance, aesthetics, politics and subjectivity as well as feminist theory, queer studies and contemporary cultural studies. Currently, she is working with colleagues the re-publication of James Baldwin’s illustrated book, Little Man, Little Man and a new book about the intersections of sculpture and performance. Sponsored by Hemispheric South/s Research Initiative, the Center for Literature & the Environment, the Chicano Studies Institute, the Department of Feminist Studies, the Hull Chair in Feminist Studies, the Department of Film & Media Studies, the Department of Spanish & Portuguese, the UCSB Women’s Center, and the IHC.